Most of these boys bedroom ideas are based on themes. It’s always good to keep the interest of your child in mind and accordingly design his bedroom. 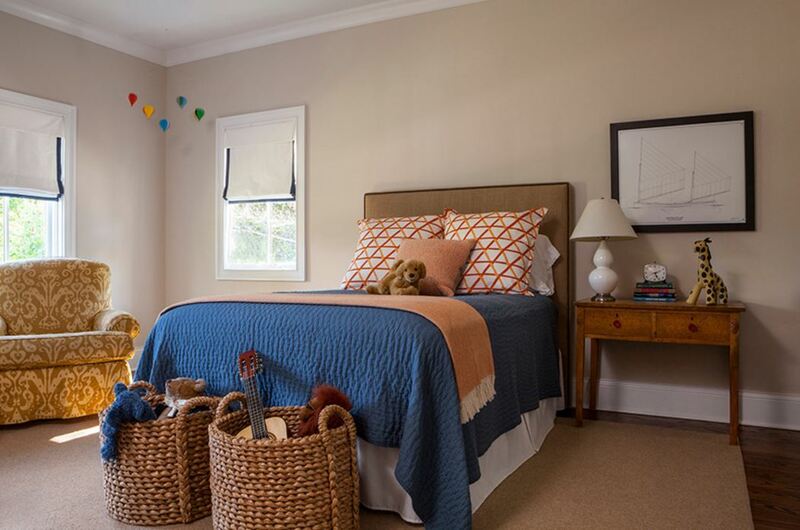 This way the bedroom becomes a space where your child can relax and rejuvenate. Every child seeks his own special corner and it should be our priority to give our children their own sweet nest to blossom. 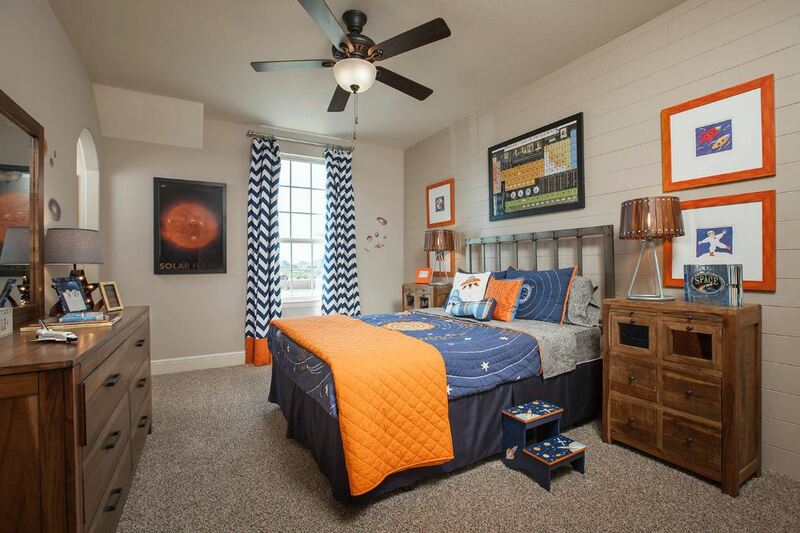 Here are some awesome theme based boys bedroom ideas for you. The child seems to be a lover of airplanes, hence the miniature airplane behind the bed. The wall, the curtains and the bed spread are all in blue, perhaps giving him the feel of the blue sky. The multicolored rug and the beautiful chair looks unique and gives more color to the room. 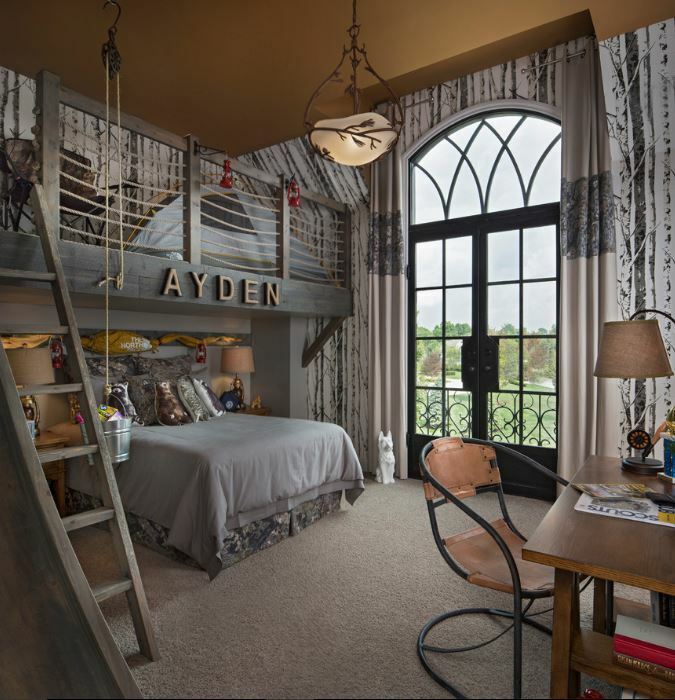 These are unique boys bedroom ideas instrumental in giving wings to their imagination. This ‘astronaut’s room’ has got the entire universe under the roof. Use lots of photographs to decorate the walls of the bedroom. The bed spread too has the entire solar system printed on it. Add dresser and side tables that offer some nice storage. Check out this reclaimed natural wonder! These are rustic boys bedroom ideas are very relaxing. The tree painted on the walls along with the dark wood furniture appears to be like a wood with immense greenery pervading all over the place. Place an antique clock, a swing and a matching comforter to make the perception more clear. This is an absolutely adorable Lego room. The Lego pieces and decals on the wall makes the room look cute and vibrant. This is a perfect room for two brothers. The bed spread look exciting and beautiful. 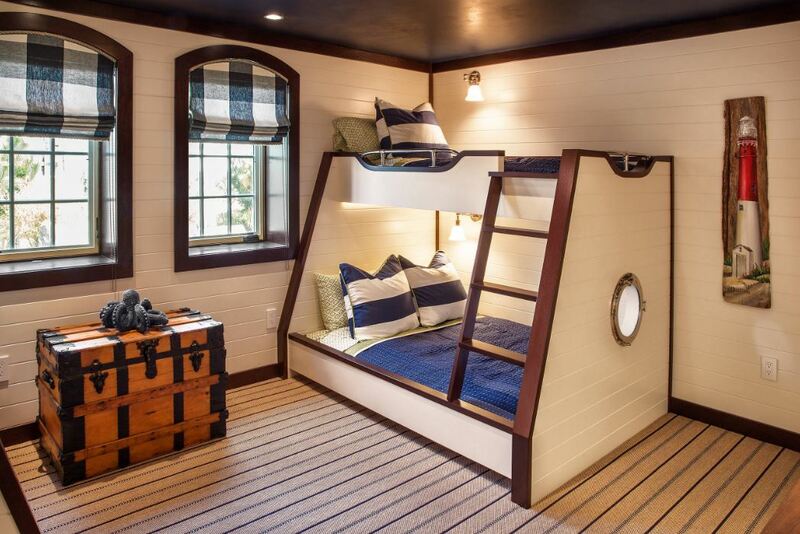 This boy’s bedroom is designed like a ships cabin. The bunk bed with the porthole and the picture of the lighthouse on the wall satisfies the idea. There is a large trunk with a cute octopus soft toy on it that suggests that it might be a little boy’s room. The checkered curtain and the striped rug give a smart look to this bedroom. 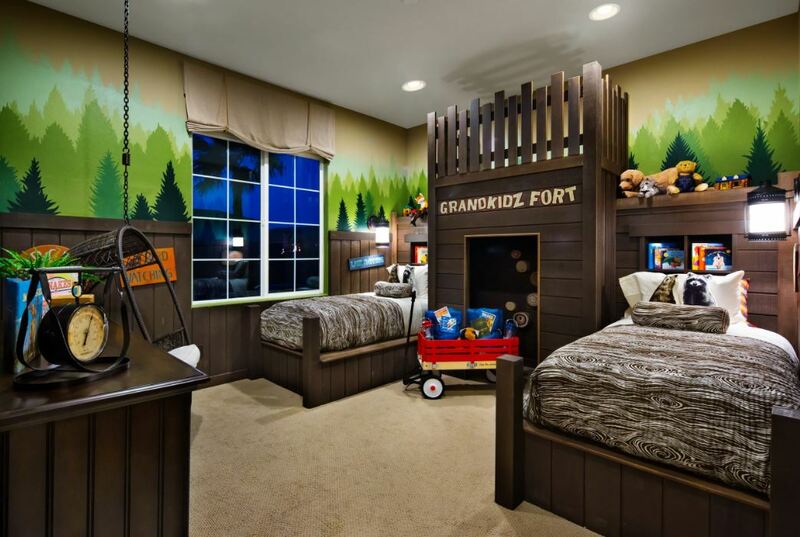 These amazing boys bedroom ideas for the toddlers are exciting and enticing. The shelves and the storage lofts offer ample storage capacity and at the same time are easily accessible, thanks to the ladder. The trundle bed with white linen looks sleek and smart. A beautiful idea indeed! A lovely and cozy looking bedroom! The upholstered bed with the soft linen is very comfortable. The blinds on the windows are looking great. This room is well organised and clutter free, and this enhances the amiable ambience of the room. 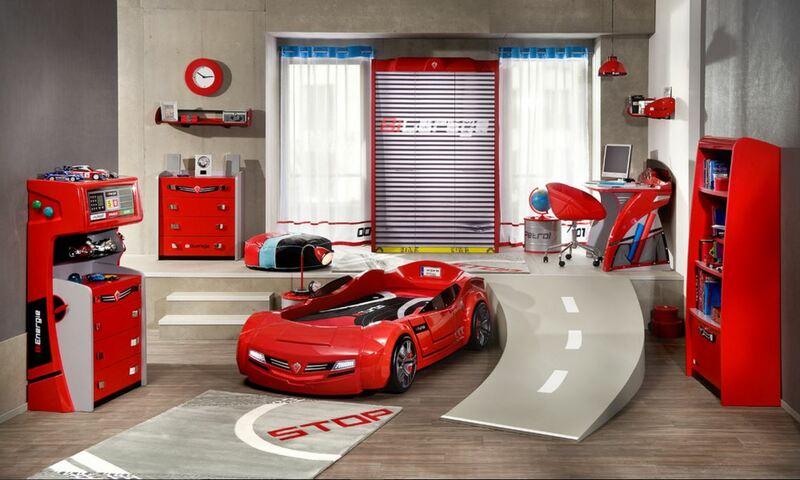 This lovely room is all set to take your little prince on a tour to the ‘Ferrari World’.This sporty car bed will have your child racing to bed every night. 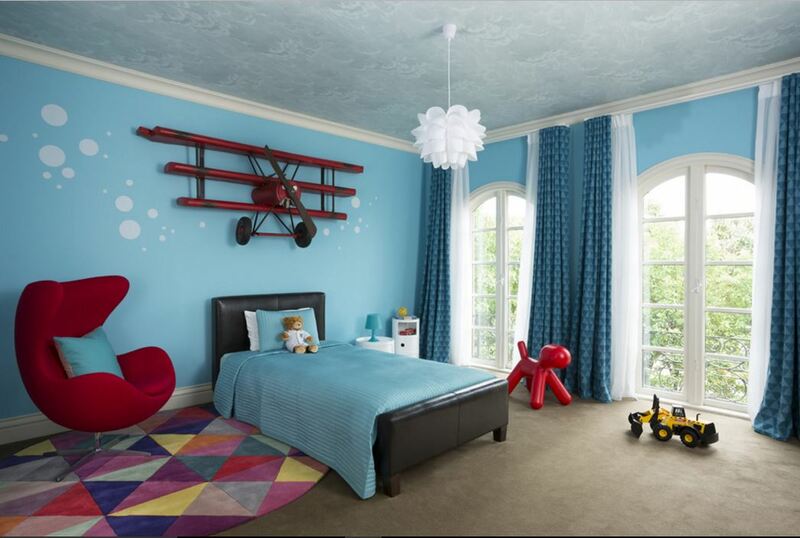 Design the room in vibrant red and grey to make it enticing enough for the boy to reside in this imaginative world. 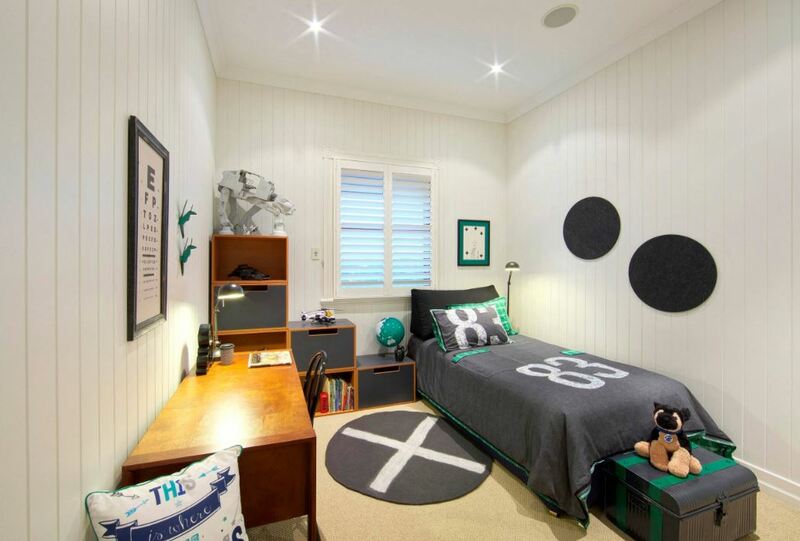 This is undoubtedly, one of the many modern and trendy boys bedroom ideas. The occupant has chosen to do up the room in ‘beach style’. The lovely mural on the wall brings us closer to the concept. 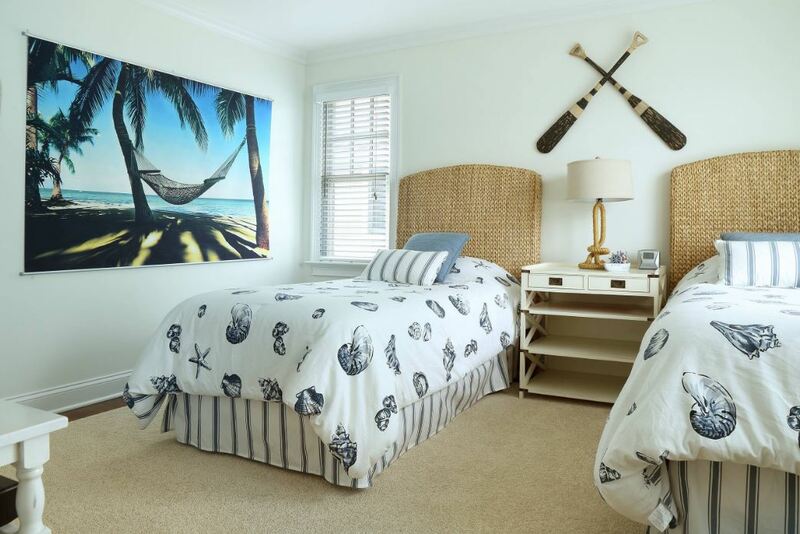 Go for a wicker headboard as it goes well with the oars and the lamp. Check out the comforters with shell print; they are really eye-catching. The flooring in fawn color gives a sandy beach feel. Here is a beautiful and cozy bedroom idea for a toddler. The study table is made to look attractive and captivating with the use of vibrant colors. You can decorate your son’s room and his bed with lots of soft toys. I’m sure this will make it more comfortable and inviting. 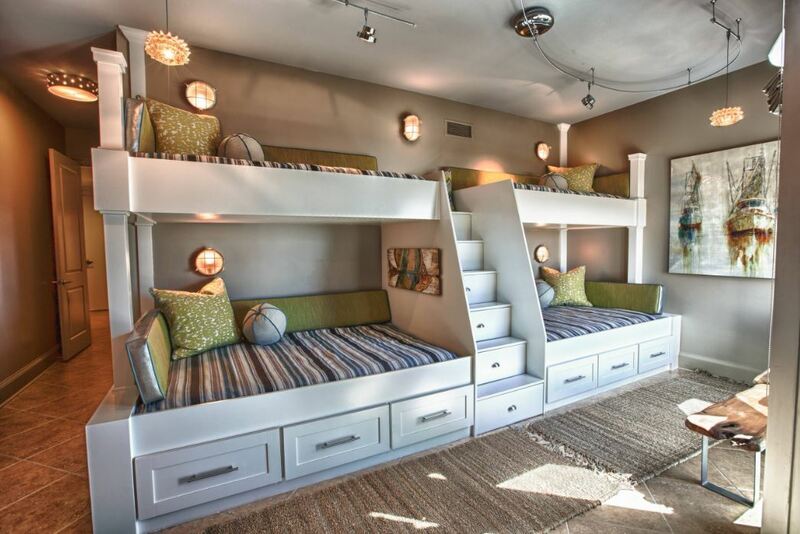 Here is an interesting looking twin bunk bed which can accommodate four kids. The length and the given space have been utilized intelligently to make the most out of it. The steps drawers are amazing. Go for track lights so that they can be arranged for the child to read and play conveniently. 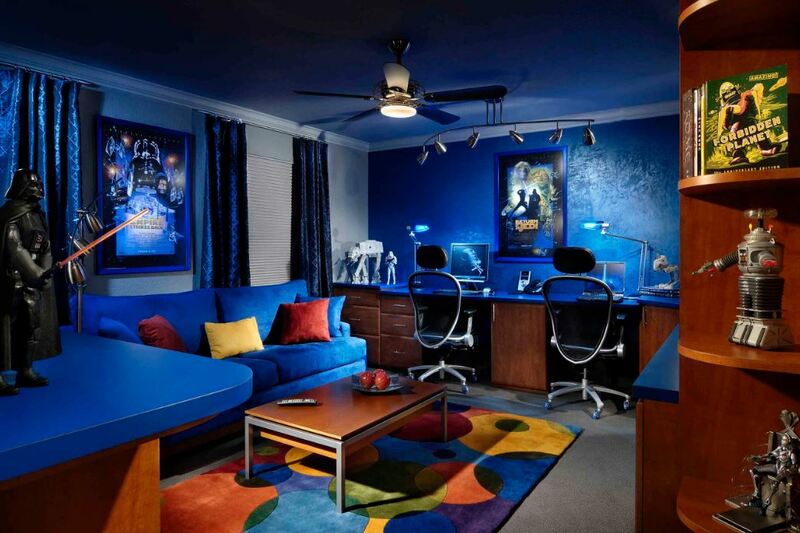 This room has a spectacular blue color over the entire space with blended blue lights and furniture. Star war characters, confirms that the child is intrigued by this epic movie. Keep the furniture simple and sleek and let the carpet compliment the decor of this bedroom. This is a typical teenager bed room design which would successfully provide enough elbow space to the child. 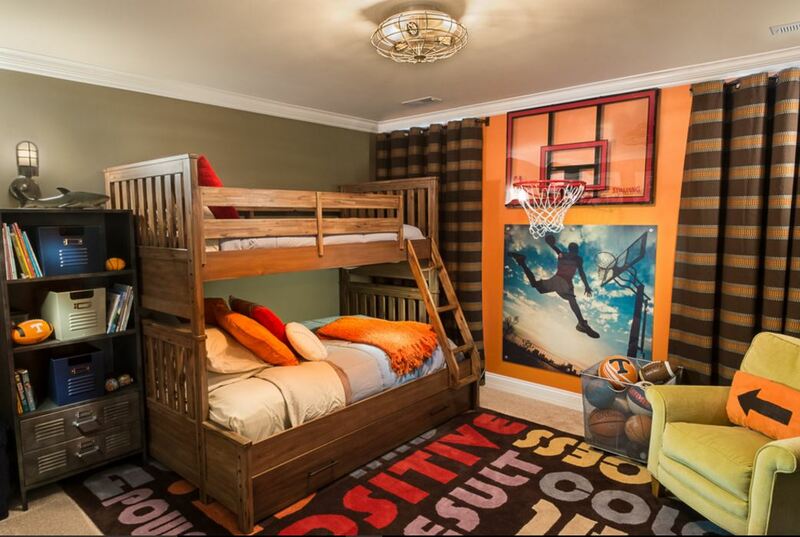 It has a handsome rustic bunk bed and the basket ball frame gives a sporty look to the bedroom. The striped curtain and the trendy rug fit well with the room decor. Here is a contemporary, simple but smart-looking bedroom. Using step storage shelves as side table is a brilliant idea. The duvet and the box give a unique touch to this kid’s room. Having shutters on window is always good for a child safety reasons. This incredible bedroom is a cool hideout for a young teenager. There is a lofty play area with a tent which looks quite interesting. Adding on to it is the wrought iron furniture, the chandelier and the decorative lanterns. I like the hanging bucket; it’s an awesome work of imagination. The color scheme in brown and grey succeeds in retaining the look of a shack. 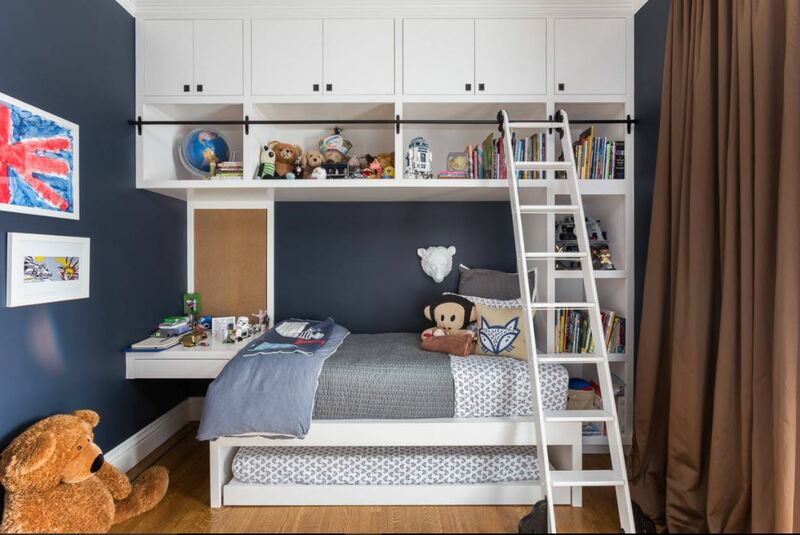 This entry was posted in Kids Room, Kids Room Designs and tagged Baby Boys Room Ideas, Bedroom for Boys, Bedroom Ideas for Boys, Boys Bedroom, Boys Bedroom Decor, Boys Bedroom design, Boys Bedroom Design Ideas, Boys Bedroom Designs, Boys Bedroom Furniture, Boys Bedroom Idea, Boys Bedroom Ideas, Boys Bedroom Ideas for Small Rooms, Boys Bedroom Paint Ideas, Boys Bedroom Sets, Boys Room, Boys Room Design Ideas, Boys Room Ideas, Boys Room Ideas Decorating, Children Bedroom Ideas, Cool Bedroom Ideas for Teenage Guys Small Rooms, Little Boys Bedroom Ideas, Teenage Bedroom Ideas for Boys, Teenage Boys Room Design, Teenage Boys Room Ideas, Teenage Guys Room Design, Toodler Boys Room Ideas by Preeti Sinha. Bookmark the permalink.